Once again, we tortured our poor bodies and woke up way earlier than we ought to, at 5am. The day before, we had made arrangements at the hotel for two Airport Limousine bus tickets, the same ones that brought us to Shinjuku. Our destination for the next 4 days? Hokkaido! We had arrived in Japan at Narita Airport a few days earlier. This time, we taking a domestic flight from Haneda Airport. 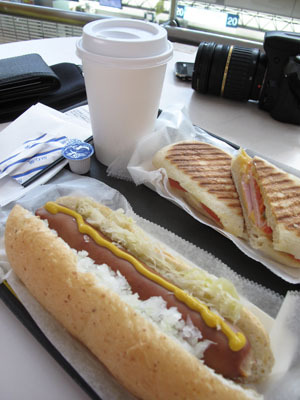 Reached the airport at about 7am and grabbed a quick breakfast. Seeking the most convenient way to travel, we bought discounted Star Alliance Japan Airpass tickets back when we’re in Singapore. Note that the purchase of Japan Airpass is only possible before arriving in Japan. Price was about 20,000 Yen for a return ticket. Our flights were supposed to be on ANA, but that ended up being a code-share with Hokkaido International Airlines (AirDo), a low-cost airline. While we were boarding, it was pretty cool to see that some Japanese didn’t have boarding passes and instead, were scanning their mobile phone’s QR code. Low-tech us had our paper boarding passes! The short flight to New Chitose Airport took about one-and-a-half hours, after which we had to switch to the JR Line (30-minutes ride) before we arrived at Sapporo Station. After what seemed like a very long morning, we arrived at JR Tower Hotel Nikko Sapporo! For three nights, we would be staying in Sapporo. As we were a little too early to check in (it was only 11am), we left our luggage with the hotel and went in search of lunch. 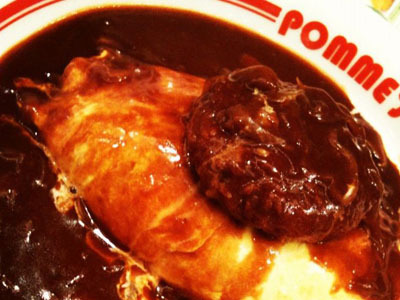 A nice place caught our eyes, and we settled on Pomme-no-ki Omu Rice. Featuring a wide array of OmuRice, it took us a while to decide on what to eat. Taking a look around, it seemed like the restaurant was popular with Japanese – from students, to young couples and the working class. Headed back to check-in at our hotel after we’re done with lunch. 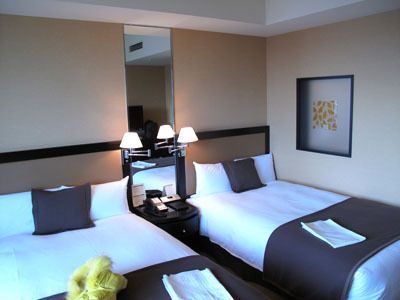 Compared to Sunroute Plaza Shinjuku, JR Tower Hotel Nikko Sapporo (long name eh?) is a much more luxurious option! We had booked a Twin Room (Moderate) from JAPANiCAN, which amazingly offered it at only 16,000 Yen per night. 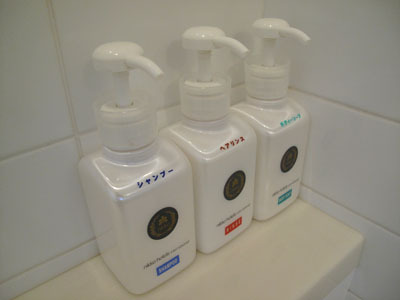 If you check the official website, it is listed as 36,000 Yen per night, for 2 adults! 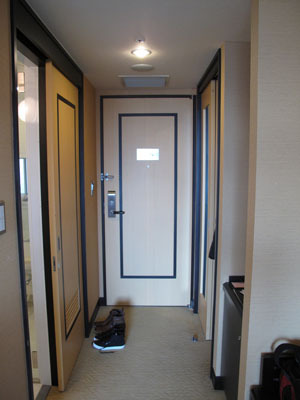 At 30 sq-metres, our room for the next three nights is huge, compared to Sunroute Plaza Shinjuku. Upon entering the room, even the passageway looked enormous. The restroom is on one side, with the wardrobe and mini-fridge on the other. Featuring a simple design with dark brown as the main tone, the whole idea is to give guests a comfortable stay. The TV console / dressing table / work desk is spacious enough to put drinks, coins, laptop and bags with space to spare. The mirror can be kept by flipping it downwards into the table. I can actually see the floor! 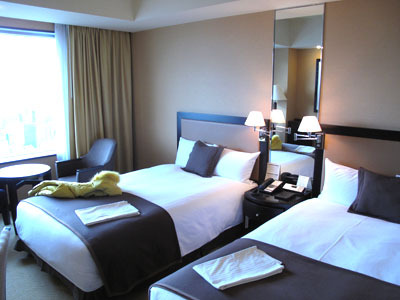 The Twin Room, in fact, contains TWO super-super-single beds! We had checked the bed’s dimension beforehand – it could fit both of us one bed comfortably. Did I mention that the mattress, pillows and cushions were ultra comfortable? When the website says that “You can enjoy breathtaking views..”, they were dead serious about it. This was the exact view that greeted us every single day! Far into the horizons, the mountains sit on the right side. From the photo, you can easily see how the buildings and roads are in a grid-like manner – the result of urban planning. 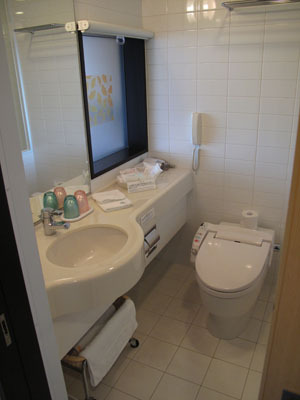 Practical and spacious bathroom stocked with the usual amenities, nothing too fanciful here. Ah. 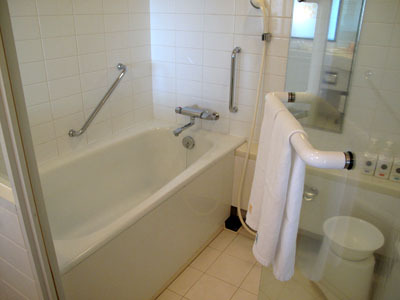 A full-size bathtub to soothe aching muscles – quite unlike the tiny one at Sunroute Plaza Shinjuku. We didn’t really have anything important planned for today, and so we got ourselves tickets to a movie at Sapporo Cinema Frontier, watching The Three Musketeers. Many people might think that watching a movie is a waste of time, especially when one is in a foreign country. However, we beg to differ. Watching a movie can be a great way of experiencing some of the local aspects of Sapporo. Don’t believe me? Read on! Firstly, we picked an English movie so that we would at least understand the movie, especially when movie tickets in Japan are extremely expensive. They cost around 1,800 Yen per adult tickets. Interestingly, various discounts are available. 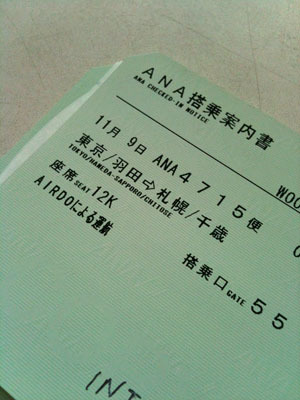 For example, it was a pleasant surprise to find out that Wednesday is Men’s Day, meaning my ticket cost only 1,000 Yen! Ladies’ Day fall on Thursday. Even so, it is much more that what a movie ticket in Singapore would cost you, where a weekend ticket is priced at S$11. The snacks and popcorn were reasonably priced though. It may seem like a surprise to you but there were no seat numbers printed on our movie tickets. Apparently, not all cinemas use a reserved seating system. For this particular movie on this particular day, it was free seating! Entering the cinema, we get to choose our seats on the spot! People were generally leaving one or two empty seats between each other. As the movie played, it seemed like the audience was awfully quiet – Shan and myself didn’t dare to laugh too loudly for fear for disturbing the rest of the cinema. 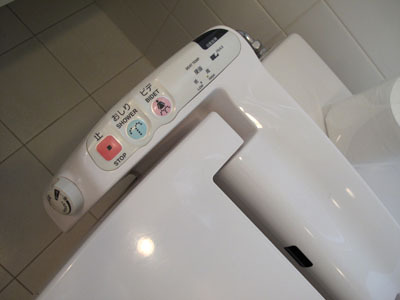 Did the Japanese understand the jokes? Perhaps the humour was lost in the translated subtitles. When we visited Japan, it was in November, and it was already getting pretty cold for us. It was a blessing that many of the malls are linked by underground passes. 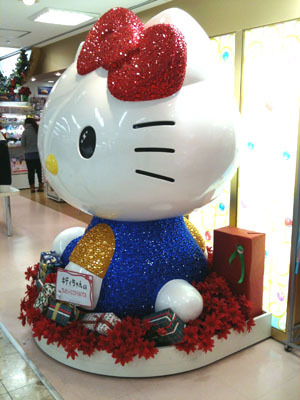 A myriad of shops line the underground connections – we spotted a iconic giant kitty! We made our way to Sapporo ESTA via the underground link. Two notable things inside are BIC Camera (selling electronics) and Ramen Republic, at level 10. If you do not wish to wander into small alleys in search of an authentic Ramen experience, Sapporo Ramen Republic is the place for you. It is in fact a collection of 8 Ramen shops, each from a different area of Hokkaido. The one we tried was 白樺山荘 Shirakaba Sansou, simply because it looks the best! Little did we know that it is pretty famous, and can command a long queue sometimes! It was rather late when we visited – no queue for us! Hmm, can’t exactly remember what I ordered. 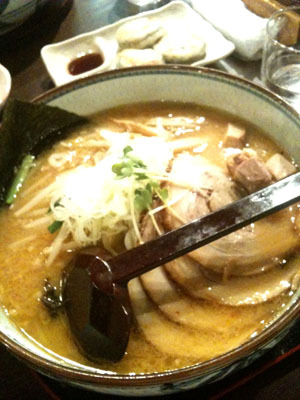 Obviously, some variant of Ramen (Miso, I think? ), and a serving of gyoza. Without a doubt, definitely the best Ramen I’ve ever had. Forget about all the others in Singapore – this is the real deal! The soup base, noodles and roast pork were simply heavenly. 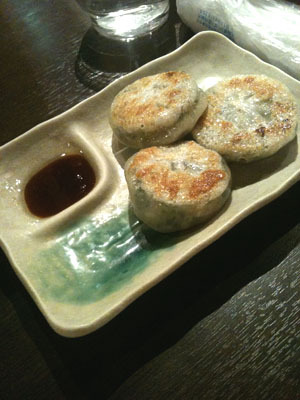 The gyoza looks different from the ones we’re used to – larger and round in shape. Servings of hard-boiled eggs are placed on the table for customers, so help yourselves to them! After two torturous (but fun!) days, we were glad to be able to spend a relaxing day in Hokkaido. For the next two days, we’ve booked private day tours with English speaking guides. 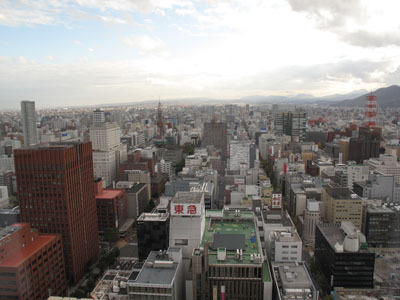 We would be exploring Sapporo and Otaru, experiencing the local culture at the pace we want!